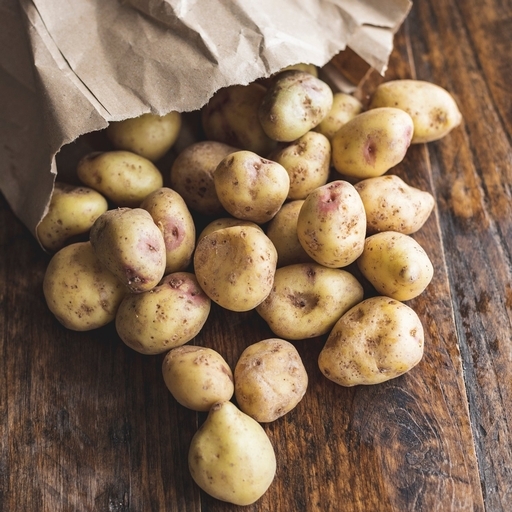 These tasty little King Edwards have been deemed too small for our standard potato bags. We would never waste such a superlative spud, whatever its size. These are still the royalty of roast potatoes, but they’ll also be perfect as a salad potato ahead of the new potato harvest this spring. The perfect roasting potato! They are almost small enough to use whole. They’ll be all the more fluffy and crisp for being parboiled first. You can decide to use them with the skin on or off. As a salad potato they’ll only take 10-15 mins to boil in a pan of salted water; some bay and split garlic cloves would be a welcome addition to the pan. Grown in Devon, by Neil and Gary Farley. Their farm has just the right soil for the job: fine and sandy, so that it is still diggable in winter. Rather than hurrying the potatoes out of the ground before it hardens up, they can leave them to grow until the last possible moment, getting more flavoursome all the while.